We can cut and bend any of the rebar you purchase from us for no additional charge. This service is especially valuable if you need a large volume of bends and cuts - such as when building foundation walls for a new home. Since you need to purchase the rebar anyway, it’s win-win. We also offer the hydraulic cutter and bender on a do-it-yourself basis for $50.00 per hour. Please note: there is a minimum one-hour charge. 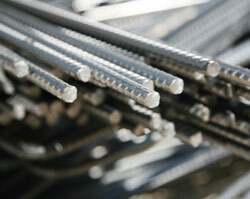 We sell a variety of diameters of rebar - including 10mm, 12mm, 1/2", and 15mm. Lengths are approximately 20 feet. Phone us at (250) 758-2401 for further details and pricing information.